hand embroidery, embroidery patterns and chicken scratch. 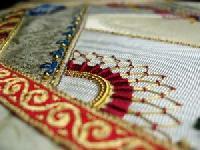 Hand embroidery is any type of needlework that is done without a machine. It can be embroidery or cross stitch. Hand embroidered pieces are usually made on a piece of material with a pattern outlined on it. Some people may embroider freestyle, using material that does not have a printed pattern.Any type of fabric can be embroidered, from silk to canvas. For beginners, small, woven cotton pieces, such as handkerchiefs or dish towels, are the best materials for learning. Look for fabric with a weave that is easy to see, as you will need to do some precise stitching to get the best results.Hand embroidery uses various sized needles. Needle size depends on thread size and material size. Fabric materials have a count, which refers to the number of holes per inch. Aida 14 has 14 holes per inch. It can hold 14 crosses per inch for cross stitching. There are many types of material for both embroidery and cross stitching the type of material used is usually dictated by the project. The higher the number of holes per inch, the smaller each individual stitch and the more thread it takes to complete a project. 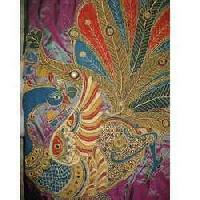 Hand embroidery designs are printed on various counts of material. Check the label to find out the count.You will also need a selection of embroidery floss for stitching. This is the thread that is stitched to complete the design, and it is available in a wide array of colors and thicknesses. Printed designs include numbers for the different colors of floss, so all you need to do is match the numbers to get the right colors for a project. Assisi embroidery is a counted thread embroidery technique. In Assisi embroidery, the work is done on even weave linen, and the background of the design is filled with long armed cross stitch or regular cross stitch, while the focal image of the design is left voided (or empty). An outline is stitched around the various elements of the design. This outline can be worked in backstitch or even in outline stitches such as stem stitch or outline stitch. Jacobean embroidery is a style of embroidery design, rather than an embroidery technique. The style includes elaborate stylized flowers, vines, plants, animals, and birds. The name Jacobean comes from James I of England (Latin Jacobus), under whose reign this style of decor became popular.Jacobean embroidery is often confused with crewel work, which is surface embroidery worked in wool. While Jacobean designs were sometimes worked in wool, they were also worked in silk and even could include metal threads, and now, Jacobean embroidery designs are worked in a variety of fibers, often combined to good effect. Traditionally, blackwork was used on clothing. The focus of blackwork is generally the variety of filling patterns used within the elements of the design. Looking at blackwork from the 16th century, a design could include vines, leaves, and flowers stitched with a heavy outline, but the inside of the leaves and flowers would be intricately filled with lacy, usually geometric, patterns.In earlier centuries, blackwork was worked normally on white or light linen with black thread, but today, it is often seen on dyed fabrics and worked in a variety of colors. Variegated silks are a popular choice for blackwork today.Blackwork commonly employs a variety of filling patterns worked in Holbein stitch, which looks like backstitch, but is actually reverse running stitch. The design is worked in one direction in running stitch, leaving a stitch space between each stitch. Then, the embroiderer works the design in the opposite direction, filling in the empty spaces with another running stitch.Modern blackwork is popularly used to create geometric designs, but can also be used to stitch beautiful picture embroidery. 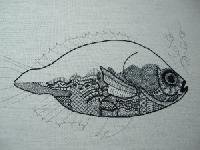 Various levels of shading can be achieved in blackwork by varying the filling stitches and patterns and the weight of the thread. Modern Blackwork is often effectively combined with counted cross stitch and surface techniques to good effect. Brazilian Embroidery is a highly textured, dimensional embroidery that uses a variety of stitches to create floral and floral related designs.What really sets Brazilian Embroidery apart from other types of surface embroidery is the use of specific threads. Brazilian Embroidery is always done with rayon embroidery floss, which is a z twisted floss with a very high sheen.Stitches commonly used in Brazilian Embroidery include bullion knots, French knots, cast on stitch, drizzle stitch, and pretty much any stitch that can be used to produce dimensional floral elements. 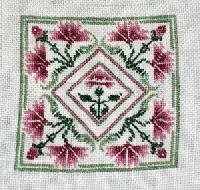 Other stitches like stem stitch, fly stitch and feather stitch are often used for stems and background foliage. Canvas work, known in the US as needlepoint, is worked on canvas, rather than fabric. Canvas work is done on two types of canvas, either mono canvas or Penelope canvas, and all types of threads can be used, including wool, silk, cotton, blends, and synthetic threads with interesting textures. As for stitches, there are myriad needlepoint stitches to choose from, though the most common stitch for filled and shaded pictures in needlepoint is tent stitch (a half cross stitch). 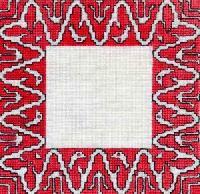 Needlepoint is a counted technique when worked on a blank canvas from a gridded pattern. It can also be done on painted canvases, with the stitcher covering the painted areas with corresponding colors of thread. Canvas work makes excellent household upholstery (for footstool covers, chair seats, etc.) as well as decorative household items such as accent pillows. It can also be framed, used as book covers, made into purses and bags, formed into dimensional sculptors, made into doorstops practically anything can be done with it! Chicken scratch, worked on gingham, is generally considered a more rustic embroidery technique. The squares of the gingham provide the grid upon which chicken scratch is worked, with the stitches producing a lacy pattern on the gingham. Chicken scratch is a simple technique it employs only a few stitches, and therefore, it is great for children. But do not be fooled! By combining stitches and thread weights and varying stitch types, intricate patterns can be produced with chicken scratch, and, when stitched on finer the gingham, the finer the results. Normally, cotton threads are used for chicken scratch. The technique is often seen on household kitchen items, such as aprons, towels, and the like, as well as other household goods, like decorative pillows and curtains. Colbert embroidery is not a widely known style of embroidery. It falls in the realm of counted work, and is similar to Assisi work, in that it employs a patterned background with the focal part of the design often voided. The design elements are outlined in heavier stitches, such as stem stitch and chain stitch.Unlike Assisi work, Colbert embroidery utilizes intricately patterned backgrounds in multiple colors and types of thread. 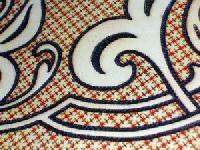 The patterned backgrounds are similar to Wessex embroidery. Counted cross stitch is an embroidery technique that uses cross stitches to create the picture being stitched. It is worked on even weave fabric. The even weave of the fabric corresponds to the gridded pattern that determines the placement of the stitches.In the US, counted cross stitch has enjoyed unparalleled popularity when compared to most other types of needlework. Most needlework shops in this country cater primarily to counted cross stitch and secondarily to needlepoint. There are few needlework shops the inventories of which do not include a heavy focus on counted cross stitch.In recent years, a resurgence of interest in historical samplers has given rise to the popularity of beautiful designs that are reminiscent of historic needlework. 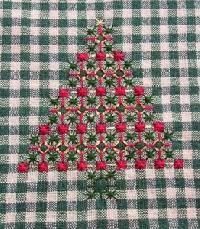 European styles of cross stitch (and other needlework adapted to cross stitch) have also become very popular. In samplers, counted cross stitch is often combined with other stitches and with other types of needlework, such as drawn thread work. These combinations have been beneficial to both the look of cross stitch (which has become more intricate) and the skill of the needleworker. Crazy quilting can look to the Victorian era for its popular beginnings, and today, crazy quilting is certainly equally or more popular than it was 150 years ago. Crazy quilting sprang from a cross between necessity and the desire for beautifully embellished items of necessity. Irregular scraps of fabric were salvaged and re made into quilts that were used for warmth, and to beautify the irregularity of the quilts made from scraps, the seams and squares were embellished according to the stitcher is fancy.Crazy quilting is certainly a free form of embroidery. Unlike most surface embroidery, this style of needlework is not dependent on any particular type of fabric, nor on any specific type of thread, nor any specific rules, really. All fabrics are game to the crazy quilter, and all threads and items of embellishment are part of the crazy quilter is arsenal.The ground for the needlework in crazy quilting is usually a patched quilt square made out of irregular shapes and sizes of fabric.